Color(s): Fawn; black mask. White bib on chest, tip of tail, white stockings on feet. 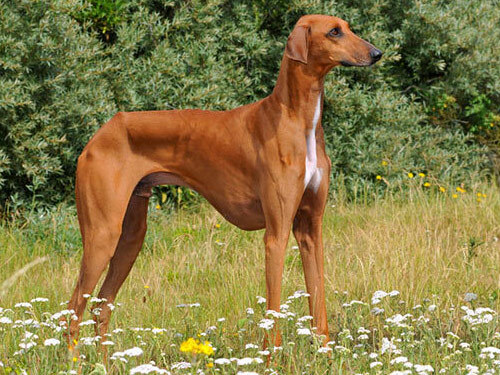 Originating in Africa, this sighthound was bred by nomadic tribes for guarding, hunting, and companionship. They are exceedingly fast when running and are able to reach and sustain speeds of up to 40 miles per hour. Azawakh's are quite adept at hunting both hare and gazelle. This breed is extremely rare in North America. The Azawakh is elegant, slender, and athletic in appearance. This breed is swift, aloof, ever-watchful, and resilient. A true pack dog, the Azawakh does well with other dogs they have been raised with. They are not recommended for first time dog owners or homes with non-canine pets. The Azawakh will do well with respectful and considerate children although they should never be unsupervised. This breed is highly protective of their family, home, and territory. They are wary and suspicious of strangers, but are loyal, gentle, affectionate, and devoted to family and those they know. The Azawakh is a regal and noble breed with incredible endurance. The Azawakh breed requires occasional brushing. Bathing should only be done when absolutely necessary using a mild shampoo. Dry shampooing will suffice. It is important to regularly check the ears and paw pads. This breed is prone to such health issues as seizures, myositis, spondylosis, and auto-immune problems. Azawakh's do not do well in colder climates. The coat of the Azawakh is silky, short, and close. This breed is an average shedder. Early socialization and structured obedience are recommended. The Azawakh breed does not respond to harsh or heavy-handed methods. They do best with motivation, respect, fairness, and firmness. The Azawakh is a highly active breed that requires a highly active owner. This breed is not recommended for apartment living. They do best with a large securely fenced yard or rural setting with ample opportunity to run. They excel in field hunting, lure coursing, and agility. Azawakh's enjoy free-play, family activities, hiking, jogging, and swimming.